Chia seeds are edible 2-3mm oblong seeds that come from a desert plant salvia hispanica. The seeds are black, dark brown and white in color, tiny and have a mild nutty flavor. There are also the red variety but the former is preferred. Chia seeds are unprocessed and can easily be absorbed by the body. They are becoming better known for their excellent source of healthy omega-3 fatty acids and is a great source of digestible protein compared to protein from animal meat. Chia seeds are very versatile and you can put them in almost any food. Chia seeds are very low in sodium and cholesterol and an excellent source of calcium and phosphorus. They have very high content of omega-3 fatty acids, fiber and antioxidants which are beneficial for overall health. An important omega-3 fatty acid in chia is alpha-linoleic acid (ALA) that is anti-inflammatory. In the micro-nutrients department, chia seeds are rich with the B vitamins, C, D and E and having minerals such as calcium, phosphorus, iron, magnesium, manganese, potassium, and zinc. Anti-cancer: The high antioxidant content in chia seeds neutralize free radicals that can cause damage to molecules in cells and contributes to ageing and diseases like cancer. Bone health: Chia seeds are extremely high in calcium, magnesium, manganese, phosphorus and protein that makes it beneficial for strengthening bones, teeth and nails. Brain health: The rich omega-3 fatty acids are helpful for maintaining brain health. It helps reduce brain inflammation, nourish and reconnect neurons, thus increasing brain performance, preventing brain deterioration and brain fog. Cellular health: Chia seeds have a low content of saturated and mono-unsaturated fats and high in omega-3 and omega-6 fatty acids which makes it beneficial for vigorous cellular development with diverse health benefits. Diabetes: Individuals with blood sugar issues may benefit from including chia seeds in their diet for their rich fiber that may also help lower blood sugar, risks of heart disease and stroke. 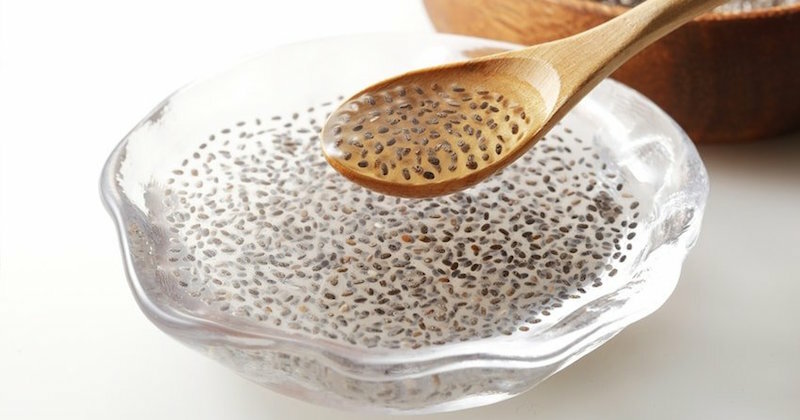 Fiber: One of the main reasons for eating chia seeds is for its rich fiber. One serving of about 30 grams (approximately one ounce) of chia seeds may meet a third of the RDA for an adult. Eating fiber daily will gradually improve digestive health. Heart health: These seeds can reduce the risk of a fatal cardiac arrhythmia or heart attack because they contain healthy fats such as omega-3 and omega-6 that are not synthesized naturally by the body. Chia seeds produce phytosterols, which help decrease the amount of cholesterol in the body and removes fat buildup in the arteries. Inflammation: Chia seeds can help reduce inflammation and may be beneficial for those suffering with arthritis, psoriasis, cardiovascular diseases, diabetes and even tuberculosis because it improves circulation. Weight loss: All of the fiber in chia seeds can absorb up to 10-12 times its weight in water, it becomes a gel-like substance and expands in your stomach which can enhance fullness, slow absorption of your food and help you eat less calories. The rich protein content can also help reduce appetite and food intake. The recommended consumption of chia seeds is about 3-4 tablespoons a day. Start with a smaller amount a day as they are fibrous and it may be different for different individuals, how they are able to tolerate fiber. They can be eaten raw, soaked in water or juice, added to baked goods, soups, puddings, yogurts, vegetable dishes, or mixed into smoothies or shakes. Chia seeds absorb both water and fat. When added to water, they can expand up to 10-12x their own weight. It is recommended to soak them for about 10-15 minute and have them fully expand before consuming. Eating them dry will have the chia seeds absorb moisture from your intestines instead, and may cause dehydration or constipation, and in some cases may even cause choking. Store chia seeds in an airtight container in a cool and dark place to prevent it turning rancid. 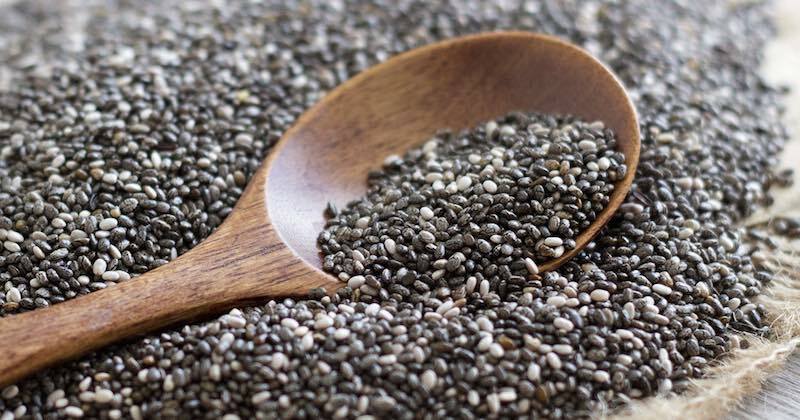 Look up 8 super ways you can add chia seeds into your diet to enjoy all its health benefits. There are no known intolerance or allergic reactions to consuming chia seeds and they can be safely consumed by pregnant and young children in small quantities.